Attended a wonderful event last night at the University of Victoria. 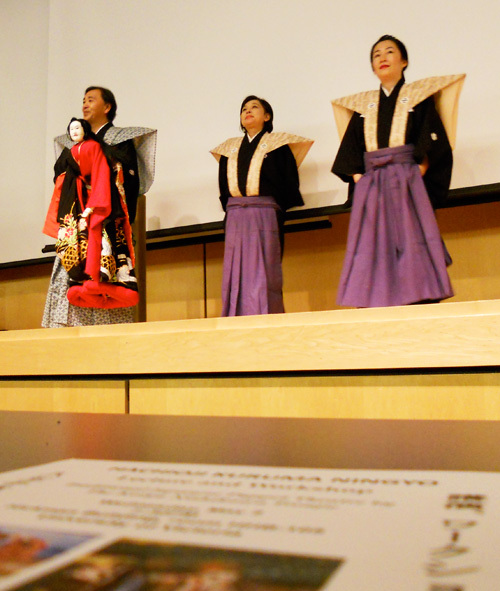 A troupe from Japan called Hachioji Kuruma Ningyo presented a lecture and performance. Mostly they explained the difference between between Kuruma Ningyo puppetry where one puppeteer sitting on a rolling stool (rokuro kuruma) operates one puppet (ningyo) and Bunraku in which three puppeteers are required for each puppet. They also explained how a chanter, musician and one or more puppeteers work together to tell historic and cultural stories, mostly from the Edo period when this form of puppetry was developed. The puppets are very beautiful, and the puppeteer who performed last night was the fifth generation of his family to be a professional puppeteer. We were afraid to take pictures while the performance was taking place out of respect, altho others were flashing away, so only got one shot at the end which was pretty clear. Will attach some You Tube clips. Hachioji Kuruma Ningyo at the University of Victoria. That was fun. I was excited to tell Lianne about it when I got home and got a little too enthusiastic, and she grumbled (just in fun) about me “coming home all puppety”!